This spring I started using Map My Tracks, a phone App that makes a map of your travels on a bicycle as well as giving a variety of statistics about the ride. One of the stats it gives is the Eddington number which I had never heard of before. Thanks to Google, answers to questions such as this are instantly available, (after a few searches). First of all, who is Eddington? Answer: Sir Arthur Eddington was a prominent English astrophysicist of the early 20th Century. Hmmm...nothing here about Eddington Number, yet alone bicycling....I try another google search. Ahhh, there is a scientific Eddington number, the number of protons in the observable universe... but that is not the cycling number. Here it is, the cycling Eddington Number, the highest possible integer that combines number of days cycled and miles each day. For example, to get an Eddington number of say 20 you would have to complete 20 rides of 20 miles or more. Right now, (June 26 2018) according to Map My Tracks, my lifetime Eddington Number is 21. Now this only includes rides recorded by Map My Tracks which I started in March of this year. Sometimes the App fails during a ride, the battery in the phone may go dead etc and the entire 100 mile trip counts as nothing!!! The App does not give a nice histogram of rides and as such I have no record of how many trips for how many miles to directly calculate the Eddington number. For the last few trips my number has stayed at 21 even though the last two were over 22 miles. It must be that I have some past ones between 21 and 22 miles that these recent ones only replace, and do not increase the Eddington number. Warning, trying to increase your Eddington number can be very frustrating. The trip to Valleyfield is described here. This trip, a loop from Lachine to Olympic Stadium pushed it up to 22. I got fed up with the map My Tracks version of the Eddington Number, so may rides are not included!!! I made a spreadsheet of all the longer rides mentioned in the Minutes , this gives an Eddington of 32. This Eddington Number gets under your skin and changes how one cycles. 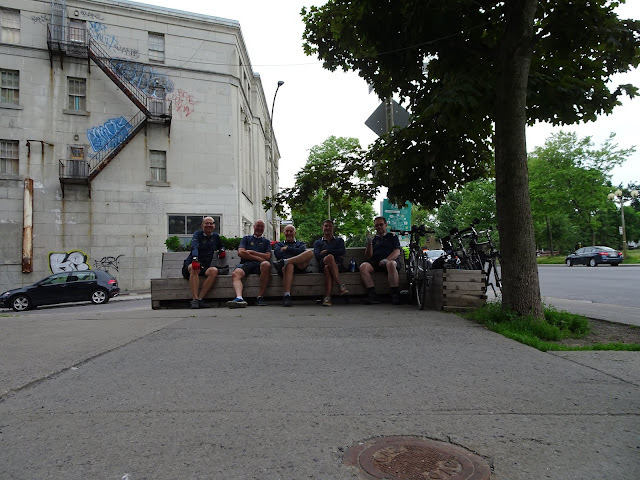 After the 25 August ride to Kahnawake I checked the Odometer reading, just over 60 Km. That wasn't enough to push the Eddington Number up one so I did some additional laps near Summit Park to bring the total day's mileage to 68. Hurray, I can now say I have an Eddington of 40! !